In my opinion, not many things in the food realm are better than homemade bread. It can take an average weeknight dinner into the gourmet category, and these rolls are no exception! 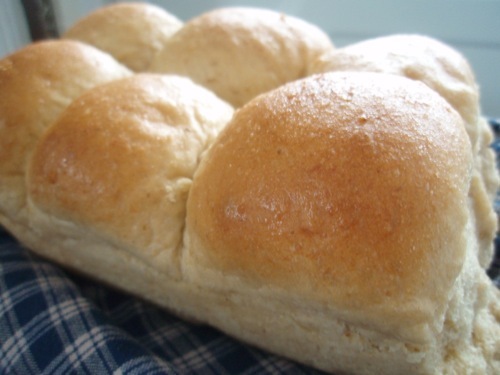 This is a simple, healthy dinner roll recipe that my family really enjoys… and I love how quickly they can be whipped up, thanks to the help of my faithful bread machine. This recipe makes a large 9″x13″ pan of 24 rolls, but that isn’t a problem at my house considering how fast they disappear! If you can’t eat them all at once, you’ll be happy to know that they freeze well and reheat beautifully. The addition of oatmeal and whole wheat flour gives these tall, fluffy rolls a hearty boost! I sometimes substitute wheat germ or wheat bran in place of some of the whole wheat flour for a little different twist. If you love homemade bread, but don’t have a lot of time to spend in the kitchen – this recipe is for you! Combine all ingredients in a 2-lb bread machine in the order listed. Run the dough cycle (if your machine has an option of dough cycles, choose the “short” one). Roll into 24 balls (if dough is too sticky, flour your hands and/or add extra flour as needed) and place in a greased 9″x13″ pan. Let rise 30-45 minutes. Bake 350 degrees for 18-22 minutes, or until golden brown (cover with foil if necessary the last few minutes to prevent overbrowning). These rolls are the perfect accompaniment to just about any meal. Could you use just all purpose flour? You could definitely use all purpose in place of the whole wheat. You could also use it in place of the oats (not sure if that’s what you were asking), but we really like the added flavor/texture that the oats give. I will definitely be trying these out! thanks for the yummy recipe! Mmmm, I can almost smell them baking! I am definitely trying these. Thank you! They do smell amazing! 🙂 You are welcome! Nice job! They look wonderful! Mine are in the bread machine as we speak. Oh yummy! Next time I need to make rolls for supper, I think I’ll try these. I love fresh bread! Thanks for sharing the recipe! What to do if you dont have a bread machine?? Yes, please let us know how to adapt this for hand made dough! I don’t own a bread machine and I actually *love* kneading bread by hand! Oh, and I’ve found that doing things by hand sometimes requires a little more flour (normally I don’t take the time to measure, but for those of you who do ;)). I made mine with the kitchen aid. I used 2 cups water and 4 cups all purpose flour, and it came together beautifully! Yum, yum, yum! If hubs wasn’t on P90X right now….maybe after he’s done in a month this will be a great treat! 🙂 Thank you! I wish we lived closer to each other. I want to raid your recipes! This is another winner, I can tell. I’ll have to check out that haircut post…Somehow I missed that one! I have had very curly hair in the past, but it gets straighter after every baby I have!!! So after years of figuring out curly hair… I now belong to the in-betweener club, and am having to learn a whole new system. 🙁 A post on curly hair on a budget would be awesome!!!! How do you modify this if you do not have a bread machine? If you scroll up a few comments, you can read my basic guidelines on how to make these by hand. Hope this helps! Could you just use old-fashioned rolled oats if you don’t have quick ones? Or would you need a different amount? Yes, you should be able to substitute the same amount. I’m guessing the rolled oats might give the rolls a little more “texture,” but they should still taste amazing. 🙂 let me know if you try it! I’m not familiar with the claw attachment, since I don’t have one. Sorry i can’t be of more help. 🙁 Maybe someone else with experience can chime in… You can see my comment above on how to make them completely by hand. Hmm … we can’t have butter (dairy allergy) but I wonder if coconut oil and/or margarine would be a good substitute?? Yep, margarine or coconut oil would work just fine. I’m personally partial to coconut oil, but margarine is fine too. If your coconut oil has a “coconut-y” taste, I would do half oil/half margarine. I have a version recipe that is without the bread machine but it takes a bit of time to make. Mine is with white flour but looking forward to trying your version. Anytime I can use my bread machine and slow cooker it is a win! BTW we have a bit in common. Name, hsing (3 but mine are older), cooking and chocolate 🙂 Thanks for the recipe. I like you already! 🙂 I totally agree about the slow cooker and bread machine. Hope you enjoy the recipe! do you think old fashion oats would work ok? i never buy the quick cook kind. They should. They might give a little more”texture” but should still taste yummy! I made these tonight for supper. Yummy. We even had a lot left for the freezer for a later meal. Do you freeze them after you cook them or uncooked? I have a very similar recipe that is absolutely my favorite. I mix it up by hand cause I LOVE kneading dough! And I have found these rolls freeze equally well baked or unbaked. When I do them unbaked I let them rise once, punch down and let rest, then make my dough balls and put them on a greased cookie sheet far an inch or two apart so they won’t touch even if they rise a bit. Then I put them in the freezer and freeze till solid. Then I remove the rolls and put them in a plastic bag. When I want to get them out to use them, I make sure I remove them from the bag and put them on a greased baking sheet right away. DON’T let them thaw out in the bag or you’ll have a huge mess :-). Let them thaw and rise at room temperature till doubled and then bake according to instructions. Of course it is hard to know how long it will take to thaw because it depends on the room temperature, but I usually figure 3 to 5 hours to thaw and rise. Absolutely the most delicious roll recipe ever. Thanks for the tips on freezing, Doreen! 🙂 I think I have a long ways to go on my knowledge on freezer cooking! This definetly helps. 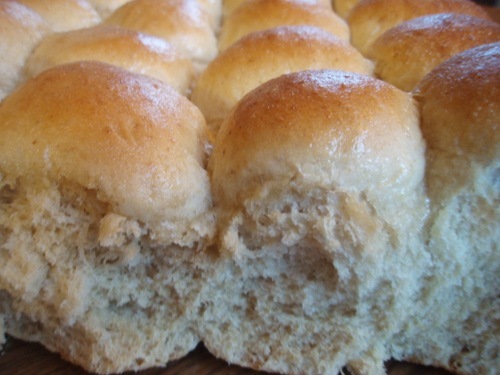 MMM….these rolls look sooo good! 🙂 I will have to remember this recipe the next time we want some real fresh bread for supper. 🙂 Thanks for sharing! These look great. I love making pull apart rolls. It is a very efficient way to bake bread in my toaster oven. Thanks! I have an old breadmachine but it for a 1 pound loaf…can I halve this recipe aand be successful? I have never used the breadmachine without a boxed mix and even that was years ago. I just dragged it out of the basement and would love to use it. Should work! Just use an 8 x 8 pan. You might have to adjust the baking time (less? ), so just keep an eye on them while they are in the oven. Let me know if you try it! Oh my gosh I can’t wait to make these next week when I move into our new home!! What a great welcome that will be, fresh warm rolls. Thanks everyone for already asking and answering the questions I had: freezing, white flour and none bread maker. Now I wish I never got rid of my old bread maker. You can absolutely make these by hand! Just scroll through the comments and you’ll see my basic instructions for how to do it. Okay, I’m a picky cook and A recipe has to be different before I’ll give it a shot. This was a bit different with the oats and I don’t cook a lot with rapid yeast, so I thought I would give them a try. I’m commenting on this now because we just had them with dinner. This was one of the better recipes I’ve ever tried. They were soft, fluffy, and just perfect, even though they were heavier than normal rolls. I whipped up some cinnamon butter and these were a big hit. Thank you so much for the recipe Brigette! Your comment totally made my day! So glad this recipe gets the approval of a “picky” cook. 😉 Cinnamon butter sounds like a fabulous idea! We always do butter and honey, but I might just switch it up and use your idea the next time I make this recipe. I know my family would love it. Thanks for trying this recipe! I made these tonight and was really worried they weren’t going to turn out good. With 23 minutes left on my bread machine, I checked the dough and it was over the top of it! I know it’s a 2 lb machine so I don’t know if my yeast was superactive or what the deal was. It was still pretty sticky too so I had a hard time forming dough balls. I also couldn’t get all 24 in the 9×13 so I put 15 in there and 9 in a smaller pan. They rose and baked well and tasted delicious so I’m glad I made them. But I had to spend quite a bit of time cleaning the inside of my bread machine from where the dough had leaked over and down. I’m glad they ended up turning out good! I know every bread machine is different – my short dough cycle is only 50 minutes total (and some of that time is spent pre-heating, mixing and kneading), so if you took them out with 23 minutes left, I’m guessing yours is significantly longer than that. If you make them again, I would do exactly the same – plan to take it out early (earliER, I should say, so you don’t have to clean up your bread machine!). Or else cut back on the yeast a little bit. And as far as having a lot of dough, it sounds like you have some powerful yeast. 🙂 I haven’t had that happen before, although I do know different humidities and altitudes affect how much and how quickly dough rises. Thanks for trying this recipe and leaving a comment! Occasionally I have trouble with dough being a little sticky (for me, this depends on the weather and how accurately I measured the flour in the first place!!). It’s totally fine to add some extra flour when shaping these into balls. Thanks so much for the recipe! Tried these today and they were a hige hit with the whole family! I too went the cinnamon butter route, and they were delicious! I just pulled these out of the oven! They are delicious. I made them without a bread machine. Wonderful! I’m happy it worked just fine for you without the bread machine. Thanks for taking time to leave a comment! I made mine in the kitchen aid (or you could do it by hand or with a handheld mixer with dough hooks). Once I had made up the dough I let it rise in an oiled bowl in a warm place for about 45 mins ’til doubled. I punched it down and kneaded it a few times and proceeded with rolling it into balls. It turned out AMAZING. Several people have made these successfully without a bread machine. If you scroll through the comments, you can see my basic instructions on how to convert, and read about those who have done it. I made these yesterday for company and they turned out amazing! I used a kitchenaid, let the dough rise 45 mins ’til doubled and then rolled it into the balls. I baked half yesterday. Out of the other half I made 4 hamburger buns and 6 rolls which I froze on a cookie sheet. I took the hamburger buns out this morning and let them thaw/rise on the counter about 3 hours then baked them for lunch! Delicious! The 6 rolls in my freezer will not last long. This post makes me happy! 🙂 Thanks for trying these out with a kitchen aid, and leaving a comment so that others know it works. Glad you like these!!! My machine is old so I have a rapid cycle which is 2:20 or a quick which is 1:50 vs regular which is 3:00. ,should I use rapid or quick? You just want the dough cycle, not the complete bread cycle (which includes baking – 3:00 seems REALLY long for a dough cycle). I would go with the shortest one (1:50). OK I have a 2 lb bread machine and this totally just OVERFLOWED my machine! Dough stuck everywhere inside & out on my machine! ACK! Maybe need to cut in in half or cut the yeast. Mine started doing this also, I just stopped my machine at that point and rolled them into balls on cookie sheet. They turned out great. There have been a few others with this same problem (and many who haven’t had it, including me… Go figure!). My short dough cycle is only 50 minutes long total, so I’m guessing the issue is some machines have much longer dough cycles/longer rise time. Just take it out early, or transfer it to another bowl to rise (after your machine has done the mixing/kneading work). Sorry about a mess in the machine… I’ve had it happen before (not this recipe:)), and it IS a pain! This recipe was designed for a 2lb bread machine – some machines are only 1lb or 1.5 lb. My machine can’t COOK a loaf using 6 cups of flour, but it can handle that much flour for the dough cycle. I made these earlier today, they are amazing! I wonder if I could make the dough into loaf bread….any thoughts on what I would need to do this? It probably would work to divide this in two, shape into loaves, and bake in greased bread pans… Usually 30-40 minutes. Most of the time, bread/roll dough is interchangeable. Let me know if you try it and like it! I made these yesterday and they were delicious. Just in case anyone needs to know, I used regular oats not instant and you could not tell. I didn’t realize this until I started to make the recipe. I do have one question. My dough was very gooey and hard to roll into balls. Is yours like this. Maybe next time I need to add a little more flour. I wanted to check with you first to see if this is the way the dough should be or not. I had two of my grandchildren over and they could not stay out of the pan. My oldest had to go to a basketball banquet for dinner and she must of ate 7 rolls before she left. I don’t think she ate much at the banquet!! She said, Mamo, I just can’t stay out of them!!!! Wow! Seven rolls IS impressive. 🙂 Glad to know that regular oats work. As far as adding more flour – absolutely! The precise amount of flour is going to be different depending on a lot of things… Humidity, weather, the flour you are using, etc. Too much flour will make the dough hard, so you don’t want to add too much. But if it’s too sticky to roll into balls, flour your hands as needed, or work it into the dough as needed (some bread machines ” beep” at a point during the cycle, at which time you can check the dough and add an extra tablespoon or two of flour if it looks like it needs it). Hope this helps! Do you think that you could use gluten free flour here in place of the whole wheat? I have never had to deal with any gluten-allergies until very recently, so I’m just starting to learn how gluten-free baking works. I THINK that substituting gf flour blend works better in recipes using baking powder/baking soda, and NOT yeast bread recipes. Feel free to experiment, but I doubt a straight substitution would work. Have you tried them with out the sugar? I tend to substitute 1-2TBSP of malted barley sweetener for all the sugar. My 40 minute bun recipe seems to be working really well that way, and I’m tempted to try it with this one. I love that you have whole grain in here, it makes such a difference to my diabetic diet and the health of my family! I haven’t tried it without the sugar, and I’ve never used malted barley sweetener, so I’m afraid I’m not much help here. But I have played around with substituting honey and/or stevia for sugar in yeast breads, and it often works. 🙂 You might have to adjust the flour a little, but I would guess your idea would work. If you do try it, let me know how it works out. Has anyone tried making these with all whole wheat flour? I grind my own flour and have hard red wheat, hard white wheat, and soft white wheat. I would like to make these for dinner and was wondering if a combination of these wheats would work. Thanks! I made these tonight. I used a KitchenAid mixer with a bread hook. I followed the recipe, except I used 1 tablespoon active dry yeast that I softened in the warm water before adding the other ingredients. I had to add at least another 1.5 cups of flour to get the dough to form a ball. The dough rose beautifully. I made 24 rolls. I baked them for 22 minutes, but sadly the inner rolls were underdone. I will bake at least another 5 or 6 minutes next time. My family LOVED these! Thanks so much for the recipe. I want to try this recipe for hamburger buns next! 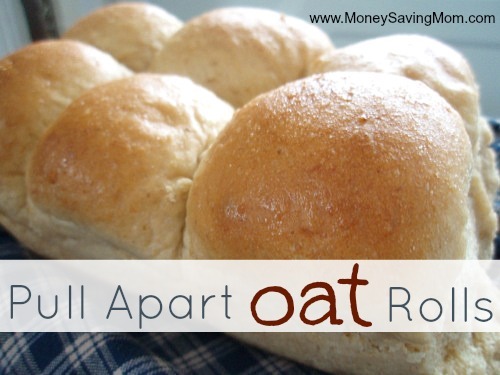 I was really surprised that you could not see the oats in the rolls! Glad you liked these! I’ve always found I use less flour for the same recipe when using my bread machine, but 1 1/2 cups does seem like a big difference. Not sure why you had to use so much extra… As far as the inner rolls being underdone, no one else has commented about having this issue. Your oven/pan must just need a little extra time. I use a glass pan – metal generally needs more time. Hamburger buns sound great! I would like to know if you use a metal or glass pan to bake these rolls, as this would affect the temp and time. I use a glass pan. Thanks! I’ll try my glass pan next time! I used my metal pan and that probably explains why the inner rolls were underdone. Glass pans cook hotter. I just reheated the leftover rolls in the oven to go with dinner tonight, and they were just as moist! Thanks again for a winning recipe! Just made these without a bread machine. I mixed all of the dry ingredients together, added the water, stirred a bit, then added the butter and honey. I did end up adding in a bit of extra flour during the kneading process. Placed the dough in an oiled bowl and let rise for an hour, punched down, let the dough rest for 5 minutes, formed into balls, then let the dough rise again for about 35 minutes. I also baked them longer – about 28 minutes in a glass pan. They turned out wonderfully. I made this recipe the other day and it is a HUGE hit. I didn’t have honey so substituted 2TBS of sugar. Then when the bread maker had 12 minutes left I looked and it wasn’t rising! My hubby was home for lunch and is looking at me and it hit me I forgot to add the yeast!! I was gonna throw it out but he calmly hands it to me from the fridge. I stirred it in and let it sit for another 30 minutes and it rose and was delicious and eaten by everyone. I am making it again tonight because it is so good! I definitely thought they were much better! We used them for turkey burgers tonight and the kids will snack on the rolls tomorrow. Although immediately during the drive home from church the kids were asking for rolls. My hubby said it tasted the same and declares after eating 4 he will not be eating breakfast tomorrow =). I love it! Glad they are being enjoyed by all!! Hi! Thanks for the recipe! If I made these Saturday would they still taste fresh on Sunday for Easter? just made these.. quick question. Do you freeze yours pulled apart ?? and you’re right.. they’re DELICIOUS!!! we cant stop eating them! I made these for our Easter lunch today and they turned out great! I used my kitchen-aid with dough hook, and used an equal amount of active dry yeast. I first put the warm water in my bowl, stirred in part of the sugar, sprinkled on the yeast, then let it stand for 5-10 min. Then I mixed it well. I then added everything else except a few cups flour and mixed on speed 2 til combied, then slowly added the rest of the flour. I endd up adding a bit more than called for. Then I kept it on speed 2 for 2 more minutes to knead the dough, then added a bit of oil to grease the bowl and let it rise for about 45 minutes right in the mixing bowl. Then I followed the directions from then on. Turned out so so good! I ate *ahem* way too many! Thanks for the recipe! I love making this recipe into two giant loaves of bread as an alternative to the rolls! It is one of my favorite go-to recipes for a healthier alternative to white bread. I’ve used my bread machine many times and never have had the dough go over the tops and down into my bread-maker like this recipe did today! Is it maybe only supposed to be 1 1/4 cups water instead of 2 1/4 cups? It is also twice the yeast that a 2 pound loaf of bread usually takes. ????? Sure hope they taste as good as everybody is saying that they enjoyed!